Sometimes I’m amazed by how easy it is to teach art in our homeschool. Maybe that wouldn’t come as a surprise if I were some gifted artist or an aficionado of finer things. But I’m neither of those things and that makes me even more determined to be sure that my kids have plenty of opportunities to explore and enjoy art. That’s how I’ve learned just how easy teaching art can be. And, sometimes the best way to teach a subject is to learn it alongside your kids. That’s why I’m so grateful that there are lots of ways to tackle this often intimidating subject. Today I’m sharing my favorites with you. Start by learning about artists, movements, and styles. You can easily do this by adding books and videos to your homeschool routine. For videos, I like the Art with Mati and Dada series on YouTube. Not only are they short, they’re also kid-appropriate, which isn’t always easy to find since some of the most famous artists dealt with tough problems in their lives. You could work these books and videos into morning time, focus on them once or twice a week, or use them to help with an art-themed unit study. Any of these would go a long way in helping your kids develop a love for art. An online class like Mixing with the Masters Mixed Media Workshop is another easy way to teach art in your homeschool. It’s a great way for older kids and teens to study some of the world’s most impactful artists and create their own masterpieces inspired by those artists. The best part is that none of the 18 lessons are parent-led, so you don’t have to involved at all, unless you want to be. Instead, they’re all taught by Masterpiece Society’s Alisha Gratehouse and they’re all fantastic. You and your students will love learning from Alisha (we certainly do!) and be amazed by how far you’ve come when the course is finished. No kidding, these courses are that good! Using a DVD-based art curriculum is one of the easiest ways to teach art without actually teaching art. These are especially great for teaching fundamental principles and concepts in art at a slower pace. Some we’ve used in the past are Home Art Studio, See the Light, and Mike’s Inspiration Station, but there are plenty of others to explore. I’ve also found the You ARE an Artist resources to be super helpful in teaching homeschool art. My kids love working with chalk pastels anyway, so utilizing these fantastic resources is a no-brainer for us. Better yet, there’s now a video art course from You ARE an Artist. 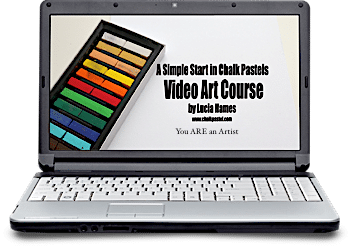 This course contains 39 lessons and includes techniques for students who are new to chalk pastels and for those who are more advanced. Lean in close, friend. I’m about to share one of my best homeschool how-tos. It all comes down to searching. Seriously. If you’re looking for ways to teach art when you’re not great at art yourself, think about what you want to study and search for your topic on Pinterest. It sounds obvious, but it’s a great option if you’re okay with piecing together your own lesson plans. Want some help searching? Feel free to peruse my Art and Art Appreciation board. That’s where I stash all of the cool art ideas I come across. Redtedart has lots of amazing art ideas all set out for you with texts to follow and artists to explore; great for beginners and intermediate alike.